I've always wanted to post this up but I have to dig out my disc and look for the picture. It's 3 years ago! Alright, here goes my story. One fine day, me and joe was walking around in Coles (to kill time). 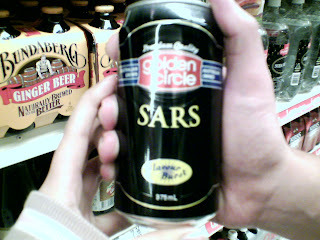 Then, something caught my eyes... which is This!!!! Want to know the definition? Here it is. Severe acute respiratory syndrome (SARS) is a respiratory disease in humans which is caused by the SARS coronavirus (SARS-CoV). I really wonder who will buy this.. It will be funny if someone bought it and met a friend. Bobby: Hey Joey! What have you got there??? Joey: Hey Bob!!! 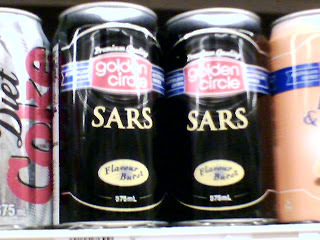 Oh, I got SARS! Want some?